The Bonegilla Collection at Albury Library Museum is the principal holding of written and photographic evidence that underpins the collective memory of former residents of The Bonegilla Migrant Reception and Training Centre. The Centre was the first Australian home for up to 320,000 migrants from more than 30 nations who arrived in Australia between 1947 and 1971. It was the first, largest and longest-operating migration reception centre in Australia. The exhibition display is a sculptural form made from historic suitcases arranged in a pile, as if waiting to be collected at a station. 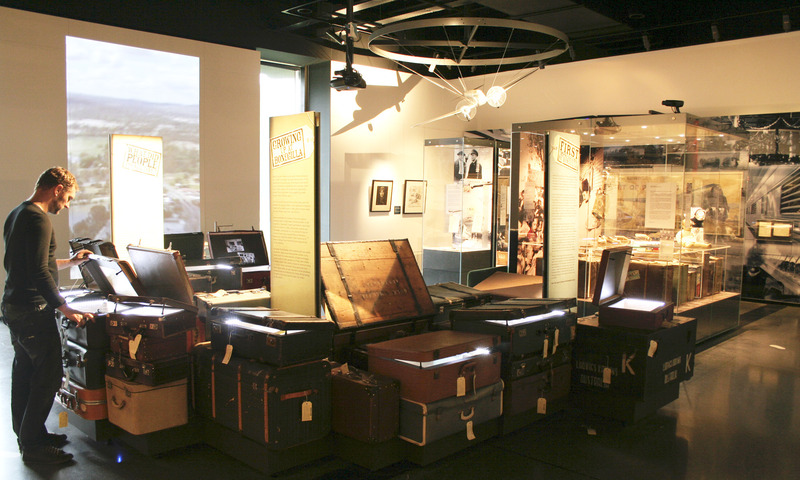 The suitcases can be opened and pulled out to view a wonderful array of Bonegilla artefacts. Each suitcase tells a different personal story about the site and the people who resided there. They are internally lit and integrate audio and fragrant components. The display engages visitors and invites them to share their own stories and add these to the display, drawing powerful connections and memories for many Australians whose family history intersects with the site.